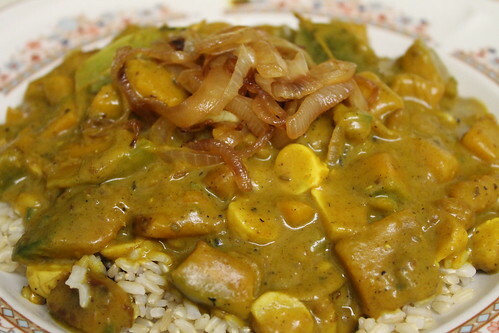 curry | Hot vegan chick.....peas! I love Sunset Magazine. They have so many cool travel and cooking ideas! Sadly, although most of their recipes are pretty healthy, they rely on a lot of meat and dairy. 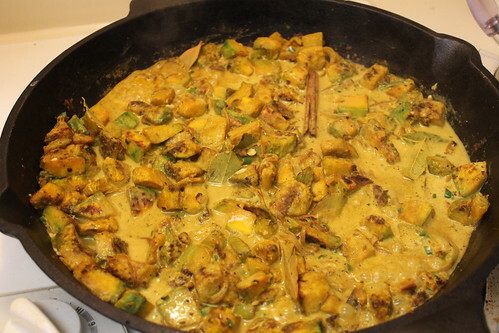 Imagine my surprise, and glee, when they featured a vegan pumpkin curry recipe! Well, I tried the recipe and I found it had potential but was a bit bland for my tastes. I made some changes, which I’ll include below. I used kabocha, my new favorite variety of pumpkin. It’s sweet, a little sweeter than butternut squash, but the thing I love the most about kabocha is its texture – sort of like a silky, firmer sweet potato. 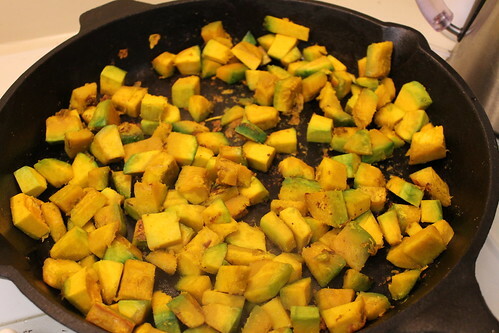 I started by sauteeing up chopped kabocha, which took about 30 min to brown. I thought I took a pic of it at the end but I guess I didn’t. It was really pretty! I also browned an onion, set half aside for garnish and added 3 minced serrano peppers, crushed cumin seeds, bay leaves, turmeric, and a cinnamon stick to the remaining onion. I added the onion and the spices to the squash, along with 2 cans of coconut milk (recipe calls for 1 can) and 1 cup water and I simmered the mix until the squash was soft (about 15 min). I wasn’t happy with the taste after reducing everything down so I added 1/2 tsp cinnamon, 1/2 tsp Chinese 5-spice, 2 tsp brown sugar, and more salt. My version was a little more liquid-y than the magazine recipe so that I would have more sauce for the rice! We served the curry over brown rice and topped it with the remaining carmelized onions. With a little soy yogurt and sriracha on the side, this was a really great dish! It even got the boyfriend’s approval!